Looking for some fun family friendly party games? I’ve rounded up some of my favorite card, board and strategy games to share with you. 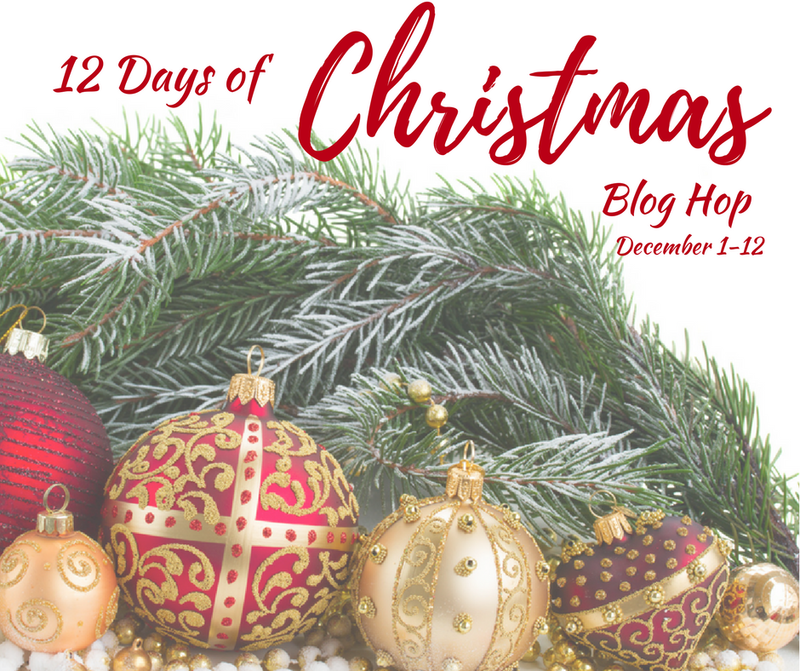 It’s day 6 of the 12 days of Christmas Blog Hop!! Missed the last 5 days posts? No problem! So far I have shared (a long with 40 other bloggers) handmade ornaments, movie craft ideas, snowman DIYs, party food recipes, and dollar store crafts. Today is all about family friendly party games! Does your family play a lot of games at family gatherings or parties? At our house, card and board games are kind of a staple, and while we don’t have any kids in the family now, we still enjoy some of those family friendly games that have become classics over the years. Scroll below to see my list of favorites! Marie~DIY Adulation | Erlene~My Pinterventures | Beverly~Across The Blvd. Utter Nonsense—We played this for the first and only time last Christmas. My husband’s aunt and uncle got it as a gift and brought it to our family Christmas to play. It’s a game of accents and is SO funny. There are cards with the name of an accent (like pirate) and you have several cards with a phrase. You choose a card to read aloud in your best pirate accent (or whatever accent card is displayed) and the “dealer” chooses which one they like best. Of course with no kids in our family we played the naughty version but there is also a family friendly version! Exploding Kittens—I bought this game when it first came out and have since bought the expansion pack Imploding Kittens that comes with your very own Cone of Shame. It’s a Russian Roulette style game, with the Exploding Kittens blowing you out of the game. We’ve played this for hours at family gatherings! 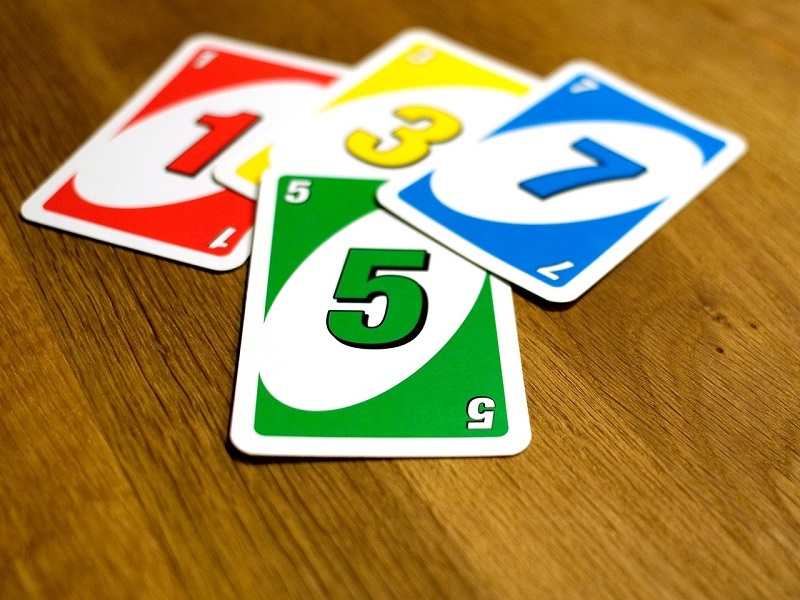 Uno—Everyone loves this classic card game! In fact, we just played this at Thanksgiving with my mom’s very ancient and worn deck. Those cards just show how much we enjoyed this game as kids and how many hours we would spend playing them on vacation, camping or just after dinner. Apples to Apples—In my family we play Cards Against Humanity (again no kids) but Apples to Apples is a nice PG version that we used to play before CAH came on the market. It’s a simple card game of comparison. The dealer draws a card with a word or phrase, and you choose from your hand of cards a phrase that goes along with it. Whichever the dealer sees as the best “apples to apples” comparison is the winner! Clue—Probably my all time favorite family board game. I played this all the time as a kid and it’s actually the first board game I bought as an adult for game nights. 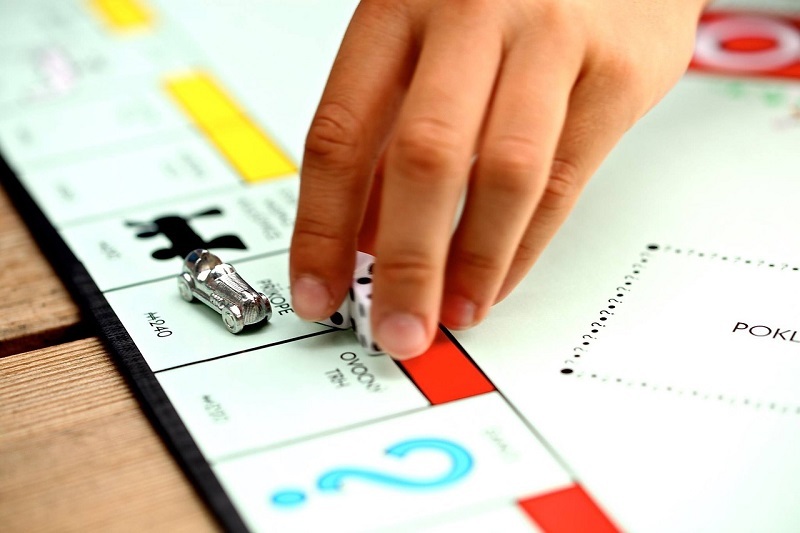 Monopoly—Oh the game that can end friendships, cause family drama and put you and your spouse into marriage counseling. Just kidding. Or am I? We have several versions of this game, yet it never EVER comes out of the closet. Not only can a game go on forever, it is so frustrating when you are already poor and you land on an opposition’s property filled with hotels. I think it’s funny they now have a “speed die” to make game play quicker. Risk—I haven’t played this myself, but my husband has many fond memories playing with his family as a kid. They had a NYE tradition that involved hours of playing Risk. Stratego—My brother and I played this all the time as kids. He usually won because I was so much younger and less skilled than him (that’s my story and I’m sticking with it). I still have the original game that looks more and more like an antique everyday. Scattergories—Believe it or not, I only recently played this game for the first time! My sister in law brought it a long on a camping trip of ours and we had a lot of fun playing! Cranium—Never has a game made me feel so smart and so dumb all at the same time! But really, I have spent many hours playing Cranium with friends and we always have a blast! Catch Phrase—I feel like getting creamed in the face by a flying catch phrase disk is a right of passage as a kid. You haven’t lived if you haven’t been beamed by one of these things! But it does keep you on your toes. 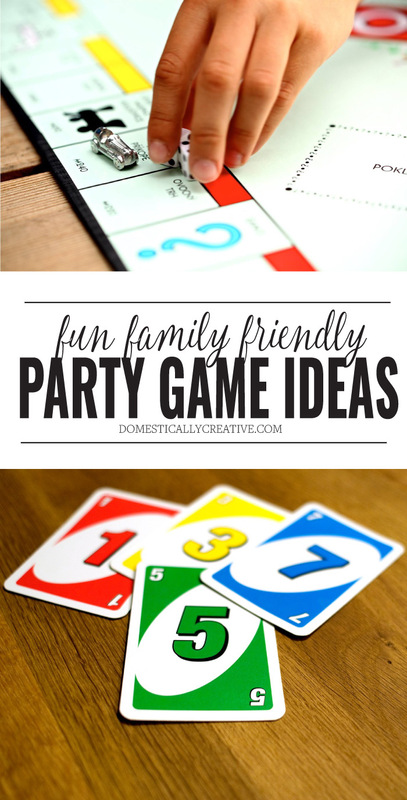 What are some of your favorite family party games to play at gatherings? Love this? Pin it for later! My parents have a monopoly Christmas game & they love to play it on Christmas Eve. We aren’t allowed to play monopoly in our home anymore haha! I love these family games and my kids love playing these games. Uno games have been known to become very loud in our house!